You might have seen large hoardings and banners competing for attention at the city corners announcing the opening of a new business or announcing some milestone achievement. However, you don’t need to be extravagant all the time for making the impression. This is why many businesses are now resorting to business save the date magnets to make their point. They know people love receiving individual invitations and they would retain full color magnets over their refrigerator doors or other visible surfaces in the home. 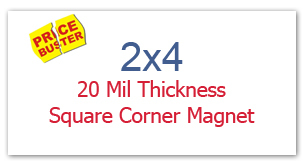 2×4 magnets make great discount coupons or savings card. They can be employed for boosting holiday sales or special sales. You can distribute discount coupons during tradeshows or in-store promotions. Everyone loves to save money, so customized discount announcement magnets are going to be a super hit, if you are eyeing some good sales. You can ask your customers to use the discount coupon code printed over custom magnets during their next purchases. Coupon marketing works great for luxury lifestyle businesses, food marketers, fashion stores and others, who are eyeing some good profits from holiday sales. Today, businesses are making it a point to wish their customers and clients during holidays because they know people would appreciate this gesture. They are sending greeting cards or holiday wishes cards to their regular customers. Now these cards are largely replaced with ones with magnetic backing because they possess high shelf life. 4×2 magnets largely remain affordable for even small budget marketer and they almost cost the same as paper greeting cards. Therefore, marketers are largely availing them for sending holiday wishes. Many businesses are seeking 4×2 magnets for making some making special business announcements such as receiving certification or they are completing years in the business or so on. They know small customized magnets can leave a strong impact on minds and they are using it for awareness building. People have a special penchant for colorful magnets and they are going to retain info magnets as a source of their pride. If you believed that small is not powerful, then it is wrong because they are indeed powerful, but you need to be little careful and wise to manage them. You can easily use 2×4 magnets for announcing various business related decisions or boosting your brand visibility. Many online stores stocking customized 2×4 magnets offer free online design proof, free full color printing and free shipping on all their orders. In addition, marketers can easily save on bulk ordering from them.